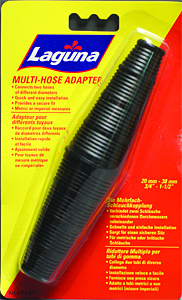 The Laguna Multi-Hose Adapter is the perfect solution for when you need to connect two hoses of different diameters together. It’s easy to install and provides a secure connection. The adapter is designed for both metric or imperial hose sizes, from 19 mm to 38 mm (3/4 in to 1-1/2 in) in diameter.